Getting here is easy. There are a number of popular ferry routings available from Denmark, Estonia, Finland, Germany, Latvia, Poland and Åland. Travel cheaper to Sweden with your Camping Key Europe. With your Camping Key Europe you receive a discount on many of the ferries to Sweden. Our ferries travel to all major Scandinavian destinations and your holiday already starts on your way there. 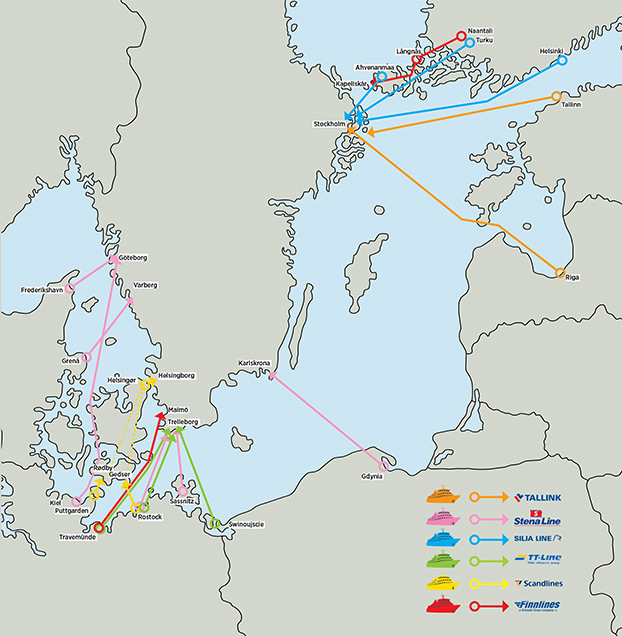 Kiel-Göteborg, Rostock/Sassnitz-Trelleborg, Frederikshavn-Göteborg, Grenå-Varberg, Frederikshavn-Oslo, Karlskrona-Gdynia. Daily departures, day and night. On board you can expect an all-round feel-good program with culinary delights, excellent service and a unique sea view. There are also family and handicap cabins available. Pets are welcome. Finnlines is one of the largest shipping companies operating the Baltic Sea. With our eleven passenger ships, Finnlines is able to connect three countries with three different routes. While your camping vehicle remains safely on car deck, you can enjoy our buffet restaurant, bar, shop and Kid’s Corner. Some ferries are also equipped with jacuzzi, sauna and children’s pool. Leading provider of high-quality cruises passenger transport services in the Baltic Sea region. Silja Line operates daily from Helsinki, Turku and Åland to Stockholm. Silja Line offers you the largest and most spectacular ships of the Baltic Sea, with popular entertainment and luxury restaurants. TT-Line – several departures from Germany and Poland to Sweden per day and during the summer from Poland to Bornholm – reliable, price attractive and direct! Find your suitable departure within our numerous range of daily departures. Welcome onboard our six TT-Line ferries! Travemünde-Trelleborg, Rostock-Trelleborg, Świnoujście-Trelleborg on daily basis, day and night departures. Świnoujście-Rønne on Saturdays during summer season. Camper-friendly – fair calculation per metre. Family specialized – with free children’s entertainment in peak season. Pets are welcome – special cabins available. Deploys some of the most advanced cruise ferries on Baltic Sea with state of the art facilities. Tallink operates daily from Tallinn and Riga to Stockholm. With high-quality entertainment and several popular restaurants, the ships are rated among the largest and most modern on the Baltic Sea.